Medics at Cambridge – I’m talking 1971 here – could study anything they liked in the third year, assuming that necessary subjects had been covered in the previous two, and that they were accepted on their chosen course. I think this is still the case. In typical Cambridge understated style, it was something that we took for granted. I look on it as truly inspired. Would that more undergraduate medical schools would do likewise. Most people did something scientific, but not everyone. To my certain knowledge a handful read Archaeology and Anthropology, a few English, a few Philosophy and a few Theology. Two of us (out of about 200) read History of Art, both from Queens’ College: me and my mate David. I like to think that David did it because of me but I may be kidding myself. It wasn’t common for medics to take History of Art, maybe one every two or three years. It was normally a two-year course, so medics with only one year to complete it were discouraged. You can see why: we lacked knowledge of historical and cultural contexts, we knew little of historical research, or of trends in art and architecture. Having said that, I wasn’t totally ignorant of architectural history. I’d been in and around churches since I was 10 or so, and something rubbed off on this curious youngster who noted details. I spent happy hours poring over Banister Fletcher and James Lees-Milne in Carlisle Library, and had parents who indulged their peculiar son (‘what shall we do with our Stanley?’ they asked the local GP – I know, because he told me 30 years later) in trips to see buildings. 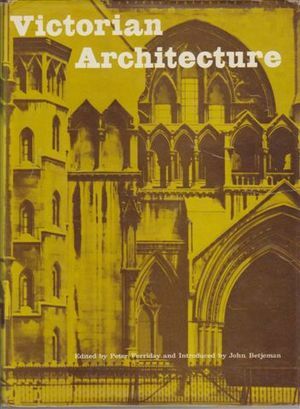 I went to Thurnam’s bookshop in Carlisle week after week just to look at the picture of Westminster Cathedral in Victorian Architecture by Peter Ferriday. The assistants were tolerant. I plucked up courage to buy it after a month or so when I was in funds. That was the book that introduced me to the word prolegomena (I’ve forgotten what it means now) and to Nikolaus Pevsner. David and I had to be vetted by the academics in the Department of History of Art. Michael Jaffé was the boss. He had rooms in King’s. We trooped off to see him. He was an expert on Titian and Rubens. I made it clear that my interests were exclusively architectural, which was allowed, but the unnerving and leonine Jaffé insisted on asking me about Titian. I knew nothing. I still know nothing. I wouldn’t be swayed from my determination to concentrate on the history of architecture, confident that I already knew enough to pass the exam tomorrow. The other interviewer was Duncan Robinson, then Director of the Fitzwilliam Museum and later Master of Magdalene (succeeded recently by Rowan Williams). That was altogether gentler and pleasanter. Anyway, they said yes. David and I both finished the course with second class exam results. Our tutor at Queens’ congratulated us warmly, saying that medics who did History of Art normally came out with thirds. Yes, we did come across Anthony Blunt, and no, we weren’t recruited. To anything. This entry was posted in A great future behind me by Rambling Rector. Bookmark the permalink.